Great canopy ! i made about 150 jumps on hurricane 135 W.L. 1.4. Always soft on heading openings. light front risers, good diving. Have had my Hurricane 170 for 4-5 years now and 200+ jumps. I've always loved the way it flew. I've come back from many long spots, can easily be down around the same time as people with much smaller canopies, and consistently stand up landings very close to where I'm aiming if not directly on target. The only consistent problem I've experienced is a 180 deg turn immediately after the canopy is completely open. A few times it's been a complete 360. Surprisingly, I never have line twists though. Maybe once. The main reason I came to write a review was because the other day, a DZ photographer noticed a bulge in my canopy while coming in for a landing. After deeper inspection, it was discovered the rib between cell 8 & 9 (as seen on parachute systems' website Hurricane designer) was torn from the bottom skin. Apparently the rib was reinforced in thirds and the middle section of the rib only was ripped. The front and back were in tact. After review of the photographer's archive photos all the way back to 2010, he saw the same bulge. But not in prior years. (Another skydiver owned it then). Since the damage was very hard to notice unless you turned the canopy inside out or stuck your head in the front in that exact spot, it was missed by myself and multiple riggers who had inspected it over the years. I'm not sure how a tear like this could have happened due to anything I did, but it wasn't enough of a noticeable difference to raise any flags. Particularly because I had never known it to fly any other way and the previous owner is now deceased. Good, the canopy is now opened ! And it flies really great. The front risers are very light compared to a Stiletto. The front riser turns are "divy" but safe and not that aggressive (I assume those are getting radical when loaded properly) The canopy is stable even in turbulences and is fast. The flare was the thing that amazed me the most ! Even for a conservative approach, you will slide a bit on the ground with your feet and I like that feeling so much ! When full pull on toggles, you will even fly a couple feet up from the ground ! I bought it on advice from instructors of my DZ and I absolutely don't regret it ! Never heard anybody saying bad things about this canopy. After jumping Saber 2´s (170), Pilot (188) and Spectre (170) I bought a Hurricane 170 (Brand new 2013) and it is just worlds apart. The canopy is faster in turns, longer in flares and so far, all openings have been silky smooth (even after some really shitting packjobs from me). 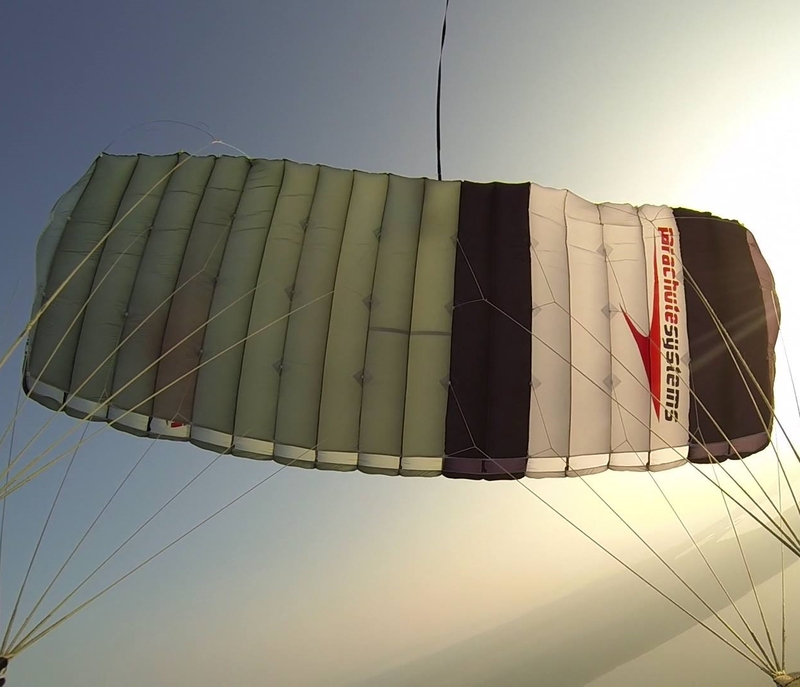 I´ve hade one linetwist which gave the canopy a strong dive, that is something I didn´t experience with the Saber 2 (however the Saber had line-twists every other jump it felt like ;) my guess the dive is due to the properties of a elliptic parachute. Now after 150 jumps with the Hurricane my plan is to buy another Hurricane (135) when the time comes to downsize. I've bought my Hurricane 170 second hand. It had about 60 jumps on it before mine, and i've put around 40 jumps on it so far. I love the way it flies, the way it turns so fast for a 170. Openings are pretty smooth, sliders tends to stay up, by a little pull on the back-risers gets him down. 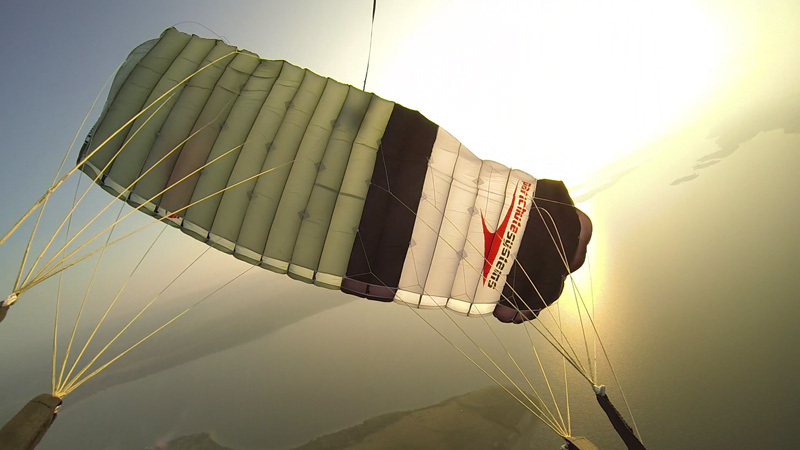 The flares are pretty awesome, not even tried front-risers landings yet. My only problem so far is that it almost always swerve to the right as it starts to fly. It does a 90-180 turn and then stopsto turn and flies straight. Now i compensate as soon as it opens to minimize the turning on opening and it goes alright. If anybody can help me with that or give me hints...it would be appreciated. I made 10 jumps with my hurricane 170, about 1.5 wload, and just happy with it...it opens soft (after Merit, with big slider, and roling tail, this canopy is perfect) it flies quiet fast, it is a high perf canopy...it lands in no wind days aswell than wind days, if you wanna flight conservatly, you can, if you wanna make a rodeo you can. dive is great, and it flight better than stilleto...it lands better, and you can have a lot of fun....in track suit it goes good, body position, normal body position and it opens in axis...you can play with your harnes during opening sequence, it takes aproximatly 800 feets and make once again great openings, good glide ratio, and really easy to pack. This canopy performs really well, opens smoothly and is easy to pack. I'm a new packer (just have jumped 3 of my own pack jobs) and even when my canopy is not small (170 sq. ft.) I manage quite well to put it in the bag. After 10 or 20 more pack jobs I will be able to be just 5 or 10 minutes slower than the packers at my dropzone :-D.
I would like also to say something about the after-sale service at Parachute Systems. I've read some comments here that is not good. I have to say that my experience couldn't have been better. I bought the canopy second hand needing some rigging. I took a couple of pictures of the defects, sent them by email to Parachute Systems (in South Africa), and just the day after I got the reply advising me to send the canopy there to be repaired. That's what I did. The repair was finished soon after it got there and the canopy posted to me well packaged and protected. I was informed of when it arrived, when it was posted... I can't find anything that could have been done better. I would give also a 5 in after-sale service to Parachute Systems. I would recommend this main chute for beginners to intermediate pilots willing to enter the world of full ellipticals with an easy one which will follow your skills progression. Easy to pack, inexpensive, what a ride! I put most of my jumps on an original sabre and got used to canopies that like to dive. I tried the Stilleto 135 but didn't really like how reluctant it was to really dive. So I was also looking into a Katana. I did some jumps on a Hurricane 135 and a 120 and decided it was the one for me. Some of these PD/Icarus/Precision canopies were over $2000 for a new canopy! My new custom Hurricane 120 cost me just over $1100. The zero porosity coating is different than other companies too. The Hurricane comes with a coating that is not slippery like other new zero P's. It was super easy to pack the first time I packed it. No slippage at all! I've since put 500 jumps on it and it is quite a ride. The toggle turns create quite a dive. You'll be able to see the horizon OVER your canopy when you spin it. It'll keep the speed up longer too. I'd say it has a medium to light amount of front riser pressure. You can really make it float too if you're out on a long spot. It offers you soo much control. The flare is really nice and powerful. You can flatten the canopy and pull out of a dive fast any time you want. My only con is that some canopies can be really forgiving with sloppy packing and body position. Not really this one. If you pack sloppy and don't keep nice body position for and through the open you can get whirly off headings and maybe a spanker (had 2 in 500 jumps on it). It's not too bad though. Just don't expect to be getting those promised nice on heading openings if you pack and pull like sh*t.
I've been jumping the Hurricane 120 for 5 years along with my Velocoty 79 & 90. My wife has been jumping it for 2 years. Its performance is excellent - much better than many of the 9-cells by other manufacturers. I chose the Hurricane after owning and jumping many different canopies. I specifically use the canopy on demos (downtown Bankok with hundreds of canopies) and big dives (357+) that require on heading openings and critical reliability. That is not to say other canopies are not as reliable but cambined with the performace and price, it is what I choose to jump. The Hurricane's openings are on-heading, it flies very nicely, doesn't fall out of the sky and its flare is powerful. I can swoop it and finish with lift to spare - I've jumped some 9 cells where the bottom falls out at the finish. Riser turns are best if you brake the canopy first and then transition to the riser(s). It isn't as fast as my Velocity but it isn't supposed to be (I'm over 195 exit weight). The Hurricaine's openings are MUCH better than the Velo. The HMA lines are great - the spectra lines that came with it required retrimming but I had them replaced with HMA by the factory rep, Louis. 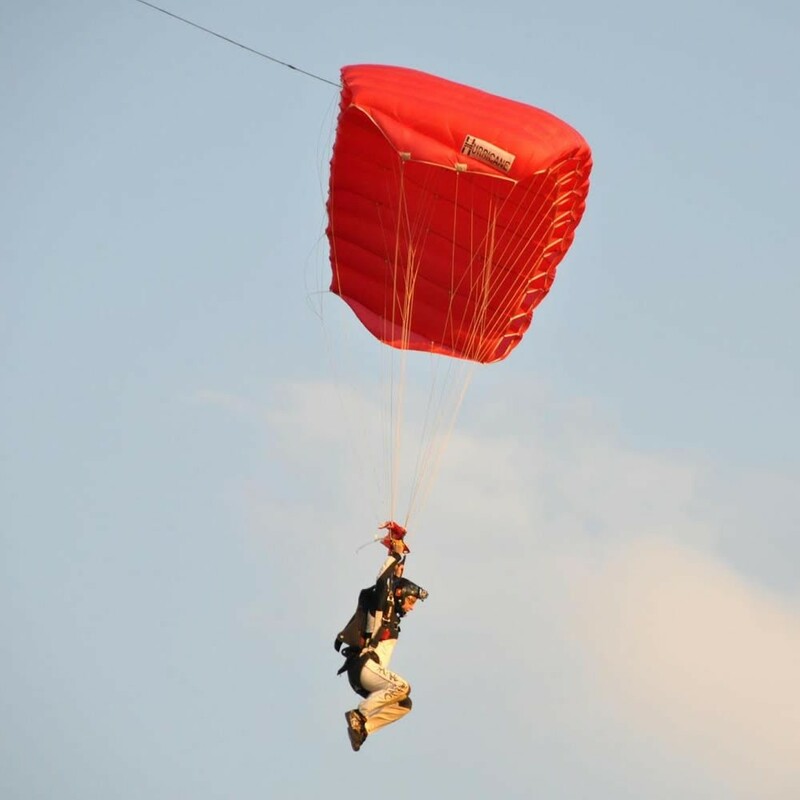 I found the Parachute Systems service very good. I'm not sure if other people with service problems didn't contact Louis, but he was prompt and professional. Take a close look at the Hurricane. I've jumped bunches of canopies and have found this one to offer fantastic 9-cell performance. I've put 200+ jumps on my Hurricane 135 and I like it very much! I picked mine up at Icarus in South Africa (through Manny). They were much better at customer service than Chute Shop (as it was called back then). The Hurricane is a great canopy for a fantastic price. It packs very easily because the material isn't nearly as slippery as most other canopies. Openings are good, consistent and smooth, and on heading if you steer it a bit. Glide ratio is very flat when in brakes allowing you to stay up there and get back when you need to. The canopy builds up quite a lot speed when flown right. I do 180 hook turns on my front risers, making deep carving turns, and I get pretty decent swoops out of it. 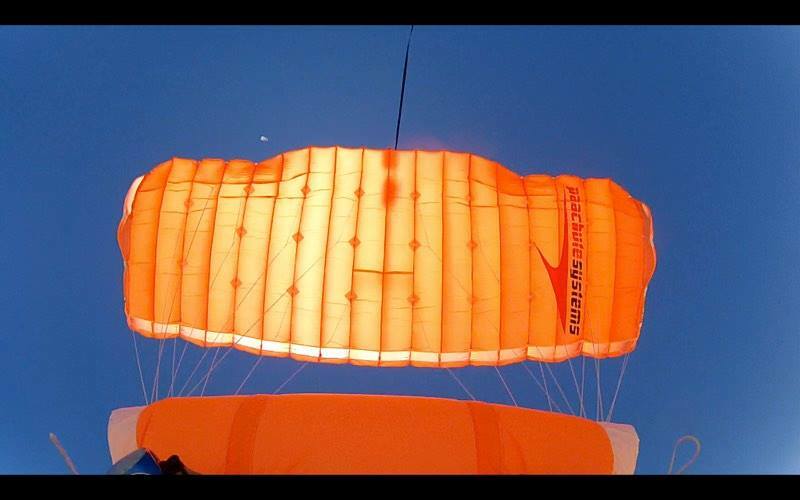 The canopy is very solid and predictable and can be flown conservatively when you need to land in a tight spot. Put it at the top of your demo list if you're in the market for a non-cross-braced elliptical. The price / performance is second to none! I have just bought my first Hurricane canopy (120sq ft) and I LOVE IT. Great openings! It performs very well in strong wind conditions (I have only done 4 jumps on it, 2 of which were in 20knt winds). 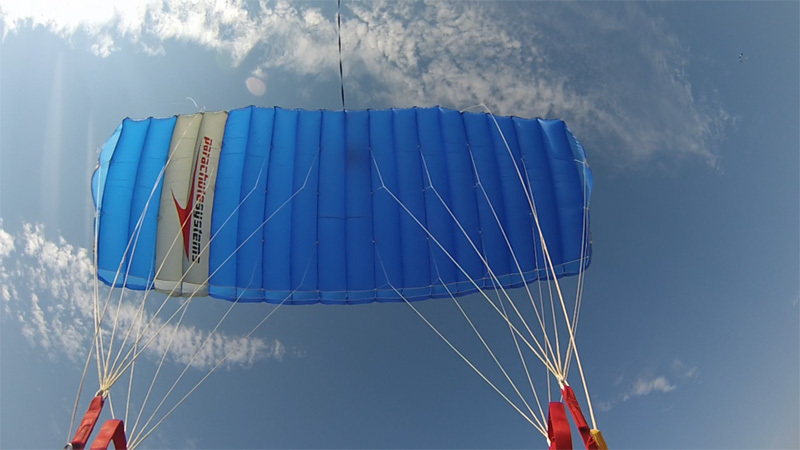 The canopy gives long dives on turns with very little riser pressure. Landings are fast but easily controlled. I ordered mine through Manny at Icarus Air Wear and got it in 6 weeks, no service problems there!!!! I am only giving this canopy a rating of 4 as I have only done 4 jumps on it and still have a lot to learn about it. Soft openings,solid in strong winds generally AWESOME canopy ! I have jumped square,eliptical and cross braced canopies and found that hurricane is the best all rounder for experienced skydivers who does not like to walk far because of a bad spot but still does not want to jump a bus to get back !! Hurricane landings are very fast if you know how !! what really makes it great is that even though its an elitical the front riser turns will be started higher than normal eliptical canopies,long and fast! !The higher turns is the same characteristics that good cross braced canopies has.Landings on a 105 hurricane was clocked at 70 mph by a radar gun..and ive seen alot faster.Taking all this into consideration the pricetag will scare you cause its so cheap being manufactured in South Africa just a few dollars counts for alot of rand(S.A-currency)No gamble here just good value !! There is nothing bad I can say about this canopy. I have used it at dropzones as high as 5 500ft AMSL. I jump it with big camera helmets and my Birdman Suit. I have won a swoop accuricy meet with it and love it to bits! It's very affordable and it is my opinion that it is one of the best 9 cell elipticals out there! any complaints about the canopy. I am loading it at 1.1 lbs/ft. I must however warn people that service is not something Chute Shop/Parachute System know well. If you really want the Hurricane and the non-existing service doesn't bother you go for it a great canopy. You have been warned. I'll give the canopy a 4 but the service is at most a -10.